So I decided to give SENMM it's own article, as it's really tricky. The NMM article is also a good read before this, but hey, read them in any order you like! For those of you who don't know, I've written several other articles you might wanna check out. 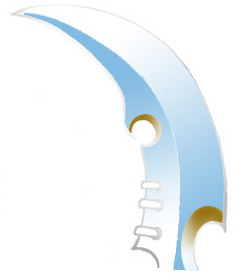 I try and get you to know everything I can, but if it seems confusing, look at the pictures and you might get a better understanding..
For those that don't know, Sky-Earth Non Metallic Metal (or SENMM) is making the sword, armor, whatever looks like it's mirroring the things around it with opaque color. This usually happens with chrome or silver, but could also be a result of super polished areas. This effect looks amazing on things if you get it right, but as we continue, you'll find many people have made some mistakes. 1. Sky- whatever is in the sky. Usually a light blue, but changes depending on time of day. 2. Horizon- where the sky meets the earth. This is where the earth is darkest and the sky is the lightest. 3. Earth- the ground. This is usually a brown color, and matches the base somewhat. 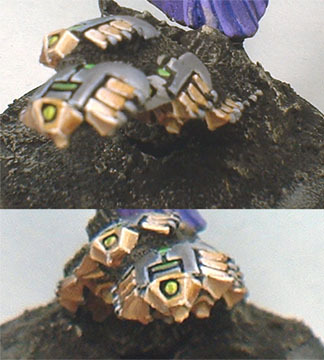 Like I said earlier in the NMM article, the trick is dark/light/dark/light. The very top of whatever you're painting should be your darkest blue for the sky and then you keep adding white until you're about mid way on the area, then you start with the darkest color of the earth and add beige, yellow, or gray depending on your ground color. "THIS IS NOT A FLAT SURFACE"
Okay, so now that we've addressed the fact what you're painting isn't flat and it has angles, let's see how this affects SENMM. It's very simple, if something is at and angle of more than Five degrees perpendicular to the horizon, it will reflect the sky or the earth, but not both. This can be seen below. As you can see, if something is perpendicular (that's just fancy talk for being vertical) to the horizon, it will reflect the whole scene that is around, namely the sky, earth and horizon. If something is angled down, even just a bit, it will reflect the earth. No Horizon. If something is angled up, it reflects the sky, again no horizon. Now, to figure out the angles a surface has, you simply look at it. Is it Cubical? Spherical? Cylindrical? Oblong? All these effect the placement of Sky/Earth/Horizon line. Look below and you'll see the directions on these surfaces in a sort of cut away view. Note that the circle has tons of angles, but no matter how you turn it, they reflect the same thing. A flat surface, however, will reflect different things when it's rotated. In all of these examples the blue arrow stand for the point where you would put the horizon line Also, I've made a sort of lop sided shape that could be the cut away view of a piece of armor. The horizon line is not in the middle like most would think, but on the bottom side. 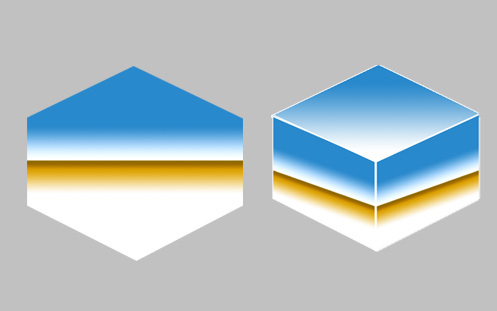 See how the horizon line is in the middle of the cylinder and cube, but not the others? That's because as we saw above, they reflect the horizon line. Remember that flat surfaces will reflect what they're angled at but in cylinders the horizon is always in the middle, even if the cylinder is angled. That's because a cylinder or tube stretches the image across it's length and it is a circle, so it will reflect everything around it. A sphere has a slightly distorted horizon line because of it's shape, too. Note how it's rounded to give off the effect the surface is round. In the other armor shape, the image is also distorted because of it's shape. 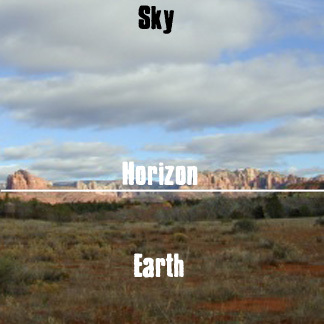 This is a good time to mention that the horizon line also depends on the surface, and the horizon. If you live in a flat area, then the horizon will be flat, but mostly likely you'll have mountains or buildings or whatever in the distance. Thus, the horizon can be slightly rugged. But the surface itself will still bend this image. If the horizon line is on a round surface, it will be rounded, but the angle will be down because that's what it would look like from eye level. If it were rounded up, then you?d be looking from below. 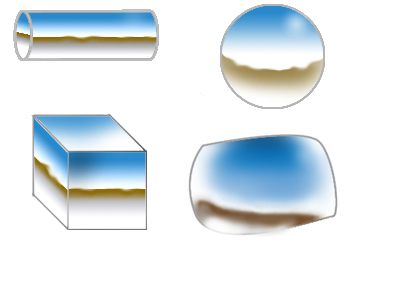 Any dents would also effect the horizon, and if you're doing it on a surface like that, feel free to add it in. It should also be noted that the way we get most SENMM affects the horizon line a bit. In modern chrome plating techniques, the material that needs to be plated goes into a sort of "bath" where through various electrical and chemical reactions, the chrome sticks to the part. This means they need to be cleaned and smoothed down, as any minor scratches will be plated and come out looking really ugly. 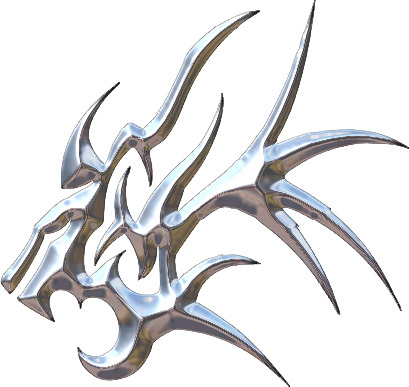 In the fantasy world, we can assume that SENMM comes from polished silver or magic metal, but it would still be smooth. The one on the left is very angular and the definition between areas is very stark. 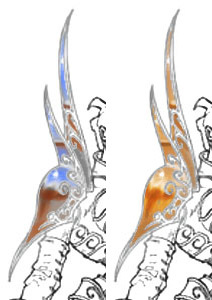 The one on the right, however shows more fluid and curvy highlights and looks like it was dunked in a chrome bath. Also note that on both of them, the angle is very light, in fact, in any SENMM you should use white or a very light blue or gray as the color for the edges. These, too should be fluid or angular depending on the surface. The Azure reminds you more of the sky, correct? In comparison, Cyan looks like the sea more than the sky. Thus, the correct color in Vallejo is Vallejo Azure. Pastel Blue can be used to darken it, but the other blues, the "Ice" blues should not be used.. 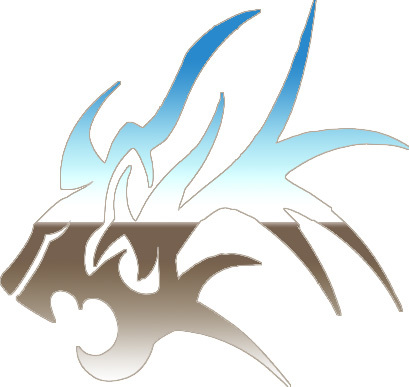 Unfortunately, Vallejo does not make a lighter Azure, so you will have to add White yourself. Now doesn't the left one seem like it would be on a gold piece of metal? It would be good for that, but not for silverish metal with pure colored SENMM comes from. The right one looks a lot better by contrast. Also, since white is vital in any NMM, it's a good way to put in the reflected light on the bottom, rather than having to put in a lighter yellow. Speaking of Gold SENMM, I did a successful experiment recently and found I could make Gold NMM without any yellow colors! They all said I was mad! What? ME! MAD?!?! Mua hah ha ha ha ha!! 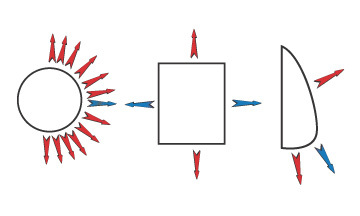 Another flaw people forget about is to add their Light Source to the SENMM, which is usually the sun. Usually, you don't have to go through the whole highlighting the exact are, you just have to blend in a spot of white to be the sun. And contrary to what you learned in preschool, the Sun is not Yellow!! The easiest way to do this is to not worry about blending and keep the areas of paint small. To do this, you simply prime or go over the area you want in white. Then you take your Azure and make a thin line, being careful not to cover up the white on top so you can use it as the highlight. Then, you do the same for the Brown, being careful not to cover the white on the bottom so it looks like the reflected light. Well, basically Colored SENMM has all the things talked about before, but it's a different color. 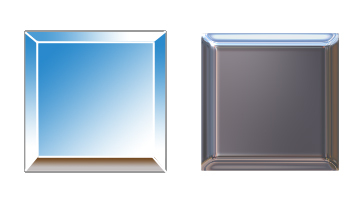 Now a little word of color: when we see a perfectly mirrored SENMM with blue sky and earth color, what we are seeing is a white or mirrory metal. If the metal was colored, it would look totally different, there would be no blue sky or brown earth, and those colors would just be different shades of the metal color. See below for pic. Notice how the SENMM is identical on both, but one looks silverish and the other looks gold? That's because the gold is not mirroring the environment colors, just the reflection. So instead of mixing blue with your gold color, you just use different shades. A thin black line is a good way for you to increase contrast, as if you don't get the colors SENMM right, it could look like that was a design in the metal, and not the reflection we're going for! Note that you could do this with any color and you're not limited to metal-like colors. 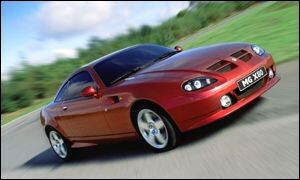 Please also see my treatise on Car SENMM below. See how it's hood looks a bit blue and near the door it?s darker, almost a brown? That's SENMM! But we all know the car is red, so we think it is shiny! I'm currently working on this to make glossy paint a bit more realistic and I hope to get some good results..
1. I primed white and used Chocolate Brown to define the Horizon Line. Notice how it's curved to give the impression of the curved surface of the shield. 2. Next I blended down to gray at the bottom to give the effect that the SENMM was on the shield and not a painted design on the shield. 3. Then went over the area nearest the horizon line with white and made several bumps in the horizon by painting in little white dots on it. 4. Painted the sky next, using Vallejo's Azure and blending down to the white. 5. Most people stop at #4 but where's your Light source?! I used a bit of watered down Vallejo Sombre Grey to define the area that would get the highlight, notice it's distorted because of the shape of the shield. 6. Using Vallejo Wolf Grey I highlighted the area more, and then added in a spot of white to finish the light source!